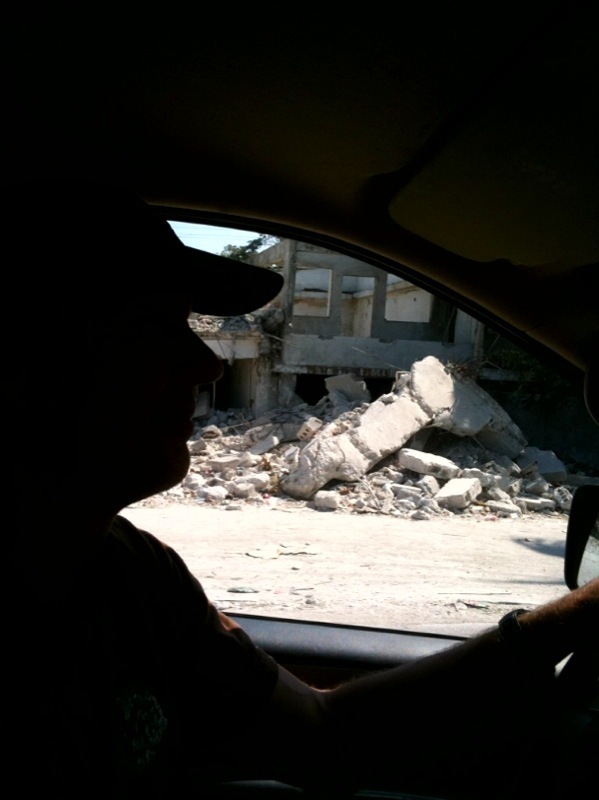 Mark Kirwin driving through Port-Au-Prince. We started our small foundation KIRF (short for “Kirwin International Relief Foundation”) in January 2005 after we returned home after surviving the tsunami disaster in southern Thailand with our children. Since then we have raised funds and have delivered disaster relief supplies to communities of natural and man-made disaster survivors nearly all over the world. Our in Haiti (2010 January earthquake relief), Burma (Cyclone Nargis relief), India (drought relief with KIRF India), Mississippi (Hurricane Katrina relief), Peru (2007 earthquake relief), Tanzania (drought relief with Roots and Shoots) and, of course, Thailand (Andaman Sea Tsunami relief). Project managing efficient disaster relief can be incredibly complex enterprise in a foreign community and culture. There is the language barrier, a foreign culture and an unknown social network, an unknown transportation network and political structure that has to be worked at a time of, sometimes, near-chaos after a huge disaster such as the earthquake that devastated the government and the Port-Au-Prince area of Haiti. Because KIRF is a small non-profit, managing the delivery of disaster relief supplies has to be done with extra efficiency. That is why we partner with local people and groups in a disaster area. Their enthusiastic support can make the seemingly impossible aid delivery effort, possible– even in the face of political opposition such as in Burma after Cyclone Nargis in 2008 and and structural violence, more recently, in Haiti*. Basically, we “help others help themselves” in a respectful and culturally appropriate manner. We do this by working with local contacts and informal aid networks in disaster areas. Informal aid networks are ad hoc all-volunteer groups of good Samaritans who are comprised of locally respected leaders such as medical workers, teachers, monks, church-leaders, local business owners and others. Our local contacts come from a variety of sources but since their disaster relief goals are the same as ours, to help people in need directly and with accountability, KIRF’s disaster relief efforts have been pretty efficient and effective. An example of a local aid network would be the monks at several Buddhist monasteries who bravely delivered our aid supplies from the Thai border to the disaster survivors in the Irrawaddy Penninsula in Burma after Cyclone Nargis.The military regime’s violations of human rights and obstruction of humanitarian aid for disaster victims was said to be “worse than Cyclone Nargis” according to the president of the Inter Parliamentary Union’s (IPU) – a prominent international human rights group. Angela Kirwin with Tanzanian Roots & Shoots youth. KIRF also works with formal aid groups with expert experience in a disaster area. For example, KIRF supported the local Roots and Shoots group in Arusha, Tanzania office with in-kind donations in 2006. ** While in Haiti, KIRF coordinated the delivery of relief supplies with an order of Salesian monks based in the Dominican Republic and identified formerly unknown camps of homeless earthquake survivors right after the earthquake to the US 82 Airborne of the US Army. Read about KIRF’s Haitian disaster relief in our February Haitian earthquake posts. Our foundation is 100% volunteer. We pay our own airfare expenses to disaster areas as do our volunteers. KIRF volunteers are also KIRF donors and have either some experience in the disaster area or have previous volunteer experience with KIRF. They are used to roughing it in areas where 24-hour electricity and safe drinking water from a tap just doesn’t exist. Our disaster relief projects are small and narrowly focused. Instead of tens of thousands helped, we make a difference for tens of dozens at most. However, KIRF’s relief supplies fill the needs of real families in need and help them make tomorrow a better day and a better future more possible for themselves and their children. To read more about KIRF and our direct delivery of disaster relief and sustainable aid please go to our web site KIRFaid.org. **Roots and Shoots is an international youth service learning program of the Jane Goodall Institute with groups of young people and parent volunteers making a difference in their communities all over the world. This entry was posted in Disaster Relief, informal aid network by arkirwin. Bookmark the permalink.